I’ve always called myself a geek, but I never really point out where my geekness lies except when I’m programming, or when I’m geeking out on a new gadget. I realized lately that there’s also another thing I’m kind of geeky about: superheroes. I’ve been reading a bit more superhero fiction this year, and it doesn’t really help that so many superhero movies came out this year, too. I really, really like reading about super beings, or humans that came with a mutation that gave them special abilities that they use to help people. I have a feeling this stems from all the times I watched those X-Men cartoons with my brother back when we were kids. Set just after the dawn of the 21st Century, in a world spinning inexorably out of control, comes this grim tale of youth versus experience, a tradition versus change, while asking the timeless question: what defines a hero? KINGDOM COME is a riveting story pitting the old guard-Superman, Batman, Wonder Woman and their peers-against a new, uncompromising generation of heroes in the final war against each other, to determine nothing less than the future of the planet. I’m not well-versed with graphic novels. Truth be told, in my mind, it’s graphic novel = comics. Isn’t it? I’m not sure, actually, but as far as I’m concerned, they’re one and the same. Correct me if I’m wrong, of course. Anyway, in the spirit of buddy reads and exploring other genres and book format, I picked up Kingdom Come by Mark Waid, illustrated by Alex Ross, through the push of my friend, fellow book blogger and graphic novel fan, Ariel. Kingdom Come is set in the DC Universe, several years into the future. Superman has gone into hiding after he was disappointed at how a superhero was acquitted for committing the murder of a villain. The other heroes had gone into hiding, too, disheartened by Superman’s and the people’s actions. Without them, their moral compass has gone astray, and the metahumans have become aggressive, blurring the lines between who are the heroes and the villains. Ten years later, we meet the story’s narrator, a minister named Norman McCay. He started getting dreams and visions of an apocalypse shortly after his friend Wesley Dodds (who is Sandman, according to Wikipedia), passed away. Soon, the Spectre shows up to him and recruits him as a witness to help him judge who are the good from the wicked in the impending superhuman apocalypse. Kingdom Come reminds me a bit of the movie The Incredibles, sans the kiddie concept. This is definitely (and obviously) way darker, and discusses a lot of deeper moral themes, such as the real meaning of justice (if killing people who did wrong is justified just because they are evil and they killed other people too), humanity (are they still humans just because they’re super?) and morality (is it ever justifiable to allow some people to be killed if it saves more people?). I guess I shouldn’t be surprised at all, with the title and everything, right? I liked how these things were tackled in the superhero universe, making it not just your normal superhero-saves-the-day story but something that discusses the things we readers most probably ponder about everyday. What really surprised me in reading Kingdom Come, though, was how familiar I was with this. I mean, I don’t know half of the heroes mentioned here since I never opened a DC comic book in my entire life until now (my brother wouldn’t let me touch his collection back when we were kids). However, I guess growing up with a brother who loves these things and watching movies and cartoons with these characters enforced familiarity. Although I had to consult Wikipedia every now and then to see who’s who, I was more or less comfortable with navigating this universe on my own. There was a lot of deep talk in this that had me rereading some parts of it again, but it was all wrapped up nicely in the end. And speaking of that ending: it was a nice, heartfelt one that had me chuckling. If you’ve read this, you probably know what I mean. :) I enjoyed reading this one, and it served as a good companion to those slow night shifts at work. Undermanned and under-funded, the Filipino Heroes League does what it can to fight against injustice. It’s tough being a superhero but its even tougher being a third-world superhero. A week after I finished reading Kingdom Come, I felt the urge to read another graphic novel because, well, I was sick, and actual wordy novels made me dizzy and/or sleepy. 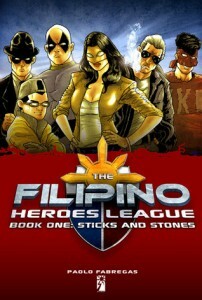 So I finally decided to pick up The Filipino Heroes League Book 1: Sticks and Stones by Paolo Fabregas, which I bought after Jason‘s very enthusiastic recommendation. The Filipino Heroes League, or FHL, were a group of superheroes that fight injustice and help the police apprehend criminals in the Philippines. Well, they fought, but because of bad economy and the defeat of all Filipino supervillains in the country, some of the heroes have decided to take on normal people jobs using their powers, and/or migrate to other countries in hopes of being an international superhero and making it big. We meet two of our heroes still loyal to the FHL, Kidlat Kid and Vis, who are off to catch bank robbers. After dismissing a warning from a kid who told them his classmate will kill a public official, they race off in a pedicab to catch the criminals, only to be scolded by the police after they set the van on fire with the stolen money still inside it. Meanwhile, government people who are in favor of the president’s impeachment are being killed one by one. When the remaining members of FHL are framed for these murders, they escape, only to find out that (1) there’s another group of “superheroes” who are off to get them and make them look bad, and (2) there’s a bigger conspiracy that ties all these events together, and tells them that what the FHL believed all this time may just not be true. 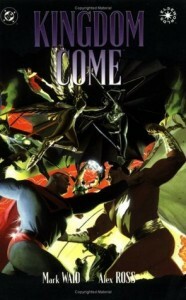 I thought it felt right to juxtapose this book with Kingdom Come, because they have similar elements: a team of superheroes, some of them forgotten and set aside, all trying to make things right with the best of their abilities. Of course, Kingdom Come takes well-known characters so it obviously has more punch, but I think FHL is pretty much at par with its foreign counterparts. If you’re looking for another good, local graphic novel to get you by while waiting for, say, the next Trese book, then I recommend the first book of The Filipino Heroes League. It helps that Budjette Tan edited this book, too. And once again: I really, really can’t wait for the next book. When is it coming out?